Thanh Hoa (VNA) - Some 100 young traditional artists are performing at the National Traditional Art Talent Competition taking place in the central province of Thanh Hoa. The artists from nearly 20 theatres and traditional art troupes of the country are presenting extracts from popular cheo (popular opera) and tuong (classical opera) performances. "The national competition aims to provide young actors a chance to meet, exchange and nurture their passion for traditional art genres," Deputy Minister of Culture, Sports and Tourism Vuong Duy Bien said. "It also encourages and promotes the young artists to show creativity in art through their roles. We hope to find more talent at the competition." 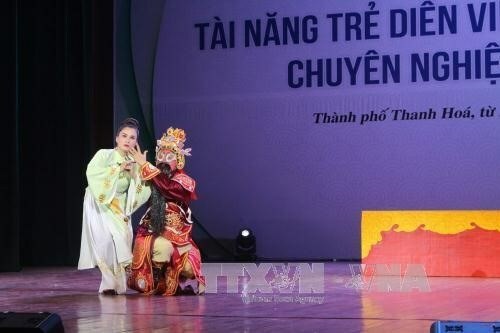 The competition is being co-held by Ministry of Culture, Sports and Tourism’s Performing Art Department, Vietnam Stage Artists Association and People’s Committee of Thanh Hoa from August 5 to 14. The competition is also an opportunity for cultural managers and heads of art units to review the development of traditional arts during the past years and the work of several traditional artists with a view to creating proper policies to preserve and boost Vietnamese traditional art genres.